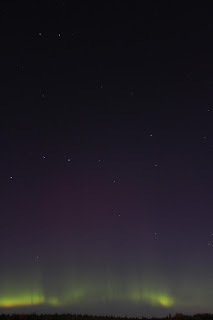 Links Through Space: Poor Draconid meteor shower but wonderful auroras borealis!!!!! Poor Draconid meteor shower but wonderful auroras borealis!!!!! On october 8th me and a friend went outside to see the Draconid meteor shower. We stood there with our cameras in place and waited for the big light show. The cameras where on tripods and programed to take a picture every 10 seconds. The exposure time was 8 seconds to 13 seconds. In two hours we saw about 20 shooting stars, and not really brights ones ether. The Moon was in the south-east behind the trees, but still was bright. The sky was clear and the very close city lights did'nt bother us to much. But still no meteor shower as we where expecting! In the middle of a routine "dew off" of the lens on my camera, I noticed on the picture some faint greenish lights, i could'nt believe it, it was the auroras borealis that came to visit us here in southern Finland. That made my night and i was very happy to have taken the risk to go out and see the Draconids and at the end to see the northern lights. It was simply amazing! Here is also a time lapse of the Northern lights, check it out its pretty cool! Remember to go outside and look at the night sky, you never know what you could see. Total Lunar Eclipse (8.10.2014). Where and When? Cambodia 2014: Ancient Astronomy, Angkor Wat, City built with astronomic measurements to mimic the Gods in the Universe. Cambodia 2014: Is there Astronomy in Cambodia? Omega Centauri Globular cluster (NGC 5139) Maroccan style! GREAT WEEKEND! GREAT NIGHT SKY! Read post series on Astronomy trip in the Sahara, Southern Morocco. Astronomy Club Toutatis, Kustavi, FINLAND. © 2017. Simple theme. Powered by Blogger.